My regular readers know I live in Eugene, Oregon, chosen recently as the “Greenest City in the Country, by Greenguide.com, a site that knows about these things. Eugene is as much a way of thinking as it is a way of life, and the vast majority of our residents – myself included – are politically progressive, socially tolerant, and environmentally conscious. I'm willing to bet anyone we have the largest per capita collection of VW busses anywhere, and with something like 72 MILES of wide, lit bike highways (with underpasses under the big cross streets), you can actually get somewhere safely on two wheels. Eugene is a very hip place, much like Berkeley was in the 60s-70s or Greenwich Village still is today. All the hippies who came here decades ago to worship the Grateful Dead and refine their free spirits stayed and have made this little corner of the world a peaceful, clean and green place. Here, people don't recycle because they HAVE to, they do it because they WANT to. MADRID, March 27, 2007 -- In an effort to develop environmentally progressive technologies for aerospace applications, Boeing researchers and industry partners throughout Europe plan to conduct experimental flight tests this year of a manned airplane powered only by a fuel cell and lightweight batteries. A fuel cell is an electrochemical device that converts hydrogen directly into electricity and heat without combustion. Fuel cells are emission-free and quieter than hydrocarbon fuel-powered engines. They save fuel and are cleaner for the environment. The demonstrator aircraft is a Dimona motor glider, built by Diamond Aircraft Industries of Austria, which also performed major structural modifications to the aircraft. With a wing span of 53.5 feet, the airplane will be able to cruise at approximately 62 miles per hour using fuel cell-provided power for the cruise phase of flight. During takeoff and climb, the flight segment that requires the most power, the system draws on lightweight lithium-ion batteries. 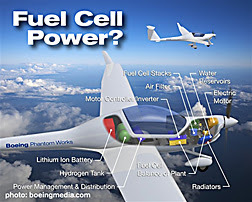 "While Boeing does not envision that fuel cells will provide primary power for future commercial passenger airplanes, demonstrations like this help pave the way for potentially using this technology in small manned and unmanned air vehicles." "It also gives us hands-on experience to complement other fuel-cell studies being carried out throughout the company." You can twist the global warming debate any way you wish, or if you live on the right side of the aisle, you can lie yourself into believe the threat doesn't exist. But for the love of God, I cannot figure out why anyone would argue that having cleaner air is a bad thing...unless maybe you own a big honkin' factory that generates obscene profits while belching out deadly chemicals. Then it makes good business sense to have cronies in high places...like the EPA. 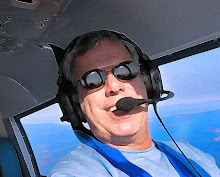 Will we see fuel cell power in a Cessna in the next few years? Don't hold your breath. I think we'll see small turbines make a move into the GA world before that ever happens. When you can hang 75 pounds of hardware out front and burn Jet A in your 172TP (turbine powered), cruising 30 knots faster while carrying 200 pounds more payload, that's when the future of GA will have truly arrived.